Stud Detector allows you to easily find metal framing studs, screws, and nails in walls. This simple to use application will help you hang pictures and art, as well as anything else that requires strong support. Tablets and phones are both fully supported! Be sure to read the short help section (accessed from the question mark icon) for detailed instructions on how to operate Stud Detector most effectively. Please note that Stud Detector requires a device with a working magnetic sensor to function properly. 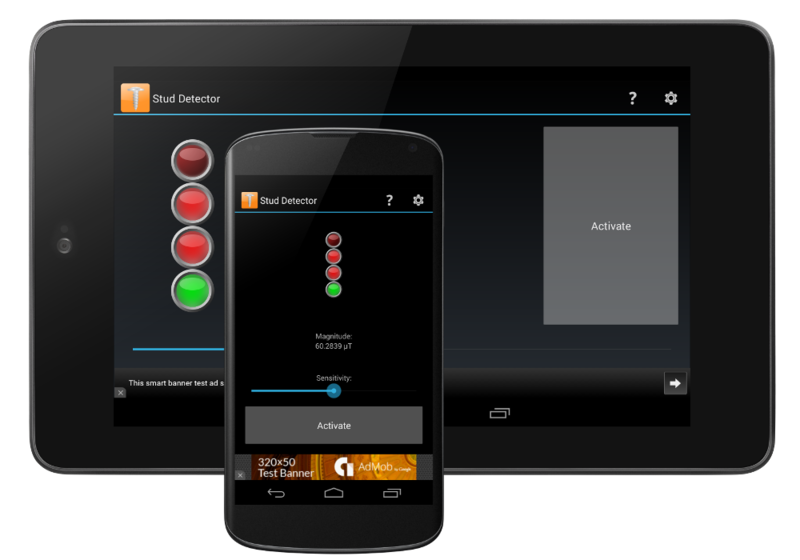 Stud Detector will alert you if your device does not have a magnetic sensor, or if your magnetic sensor is malfunctioning and provides faulty readings. © Copyright 2015-2016 Chatterbox Software, all rights reserved. Google Play is a trademark of Google Inc. All other trademarks and copyright are acknowledged as the property of their respective owners.